New book, 82 pages, 30 period photos, 67 colour profiles. This book covers the air conflict over Korea from 25th June 1950 to 27th July 1953. Contents: Concise historical narrative by aviation author Patrick Branly, 67 Colour Profiles by Richard J Caruana covering USAF, USN, North Korean and Commonwealth aircraft. 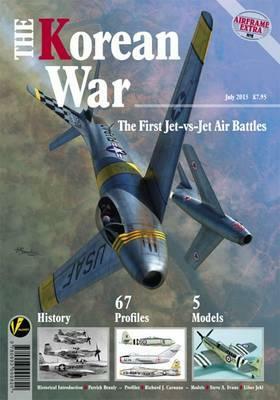 Specially commissioned kit builds: Italeri 1/32nd F-86F Sabre, Special Hobby 1/48 Firefly FR Mk 5, Italeri 1/48th F7F Tigercat by Steve A. Evans, Eduard 1/72nd MiG-15, Special Hobby 1/72nd Seafire Mk 47 by Libor Jekl. This item was added to our catalog on Wednesday 31 August, 2016.